Get access to enterprise level big data & predictive analytics technologies that can be implemented in your online store in no time. Take your marketing to the next level! We provide a set of ecommerce solutions to personalize your website and your email marketing channel. SEE OUR ROI-POSITIVE PRICING APPROACH or learn more about our solutions. Our platform provides your online store with a set of self-learning algorithms that lets you create a truly personalized shopping experience. 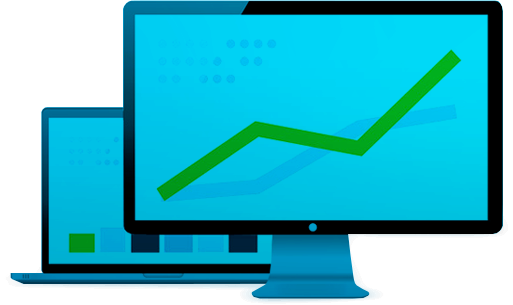 Based on A/B tests of our clients you can expect up to 50% revenue growth! Triggered emails are generated in real time based on each visitor's behavior on your website. Each trigger takes just several minutes to set up and brings you sales with no further attention. Behavioral popups are designed to be useful both for the customer and the retailer, converting up to 10% of your visitors into subscribers, while providing them with the thoughtful and personalized experience. Retail Rocket can send personalized emails automatically to your customers based on their behavior on your website as well as provide segmentation data for your email marketing platform to send much more relevant newsletters. Why would you need to try Retail Rocket? Product recommendations improve avg. page depth, avg. time on site and decrease bounce rate. That makes search engines think your site is more interesting for visitors and rank you higher. So you get more customers. A personalized shopping experience makes your website more comfortable to use. The more data you get on your customers — the better offers they receive and the more often they comeback to your website to shop. Personalized product recommendations are the alternative way of navigating through the online shop. More people find products they need. Even if they didn't think of them when they came to your website. Retail Rocket has a number of prediction algorithms that try to figure out what your customers would want next and make that offer before they go somewhere else. This approach drives more repeat customers to your website. Cross-sell and upsell algorithms drive sales to more expensive or related items, which leads to an increase in the average order value and average quantity of goods sold per order. So you sell more per one transaction. Implementation is as fast as setting up Google Analytics on your website. Real-time personalization requires a lot of proccessing power which we will provide and maintain through our cloud. Our personalization experts will guide you through the process and provide full support on each step. Setup our tracking code in just 15-20 minutes. Retail Rocket performs analysis of your customers and products database. Launch personalized product recommendations & email campaigns. 10%–50% conversion rate and average order value growth!